I've been watching cookery shows ever since I can remember.During my school days,gosh it seems so long ago!,there weren't many but whenever Khana khazana aired on Zee Tv,I sat down with my diary in which I jotted down the recipes hurriedly.There was also a show called Jhatpat Khana where all the recipes were done under 30 minutes,from start to finish. Long before I learned to converse(or rather communicate)in Tamil,I used to watch Mallika Badrinath's cookery show.Most of the times,I couldn't even make out what she was saying but I sat through the whole show without batting an eyelid.I loved the way she presents her shows,no fuss and in very simple language which made any newbie confident in cooking. Subz Badami is from one of her tv shows and the recipe looks very vague to me(probably I was more interested to see what she was cooking rather than writing it down).I've made it a couple of times with modifications and now it has become our favourite.It pairs well with Ghee rice,Porotta and Idiyappam. Cook the vegetables till tender-potato,carrot and beans can be pressure cooked together for 2-3 whistles and cauliflower and peas can be steamed till soft.Wash the vegetables in cold water immediately and keep aside. (this prevents the vegetables from cooking further and not turn mushy while the curry simmers). In a thick bottom kadai,saute onions till they turn golden brown.Switch off the flame,let it cool and then grind to a smooth paste. Grind the ingredients given for the badam paste using milk to a smooth paste. In a kadai,add oil and saute capsicum till it starts turning brown.Mix in the cooled and drained vegetables and give a good mix. Stir in the onion paste,badam paste,sugar and salt.Mix well. Whip the curd lightly and mix in,simmer for 5-7 minutes.If the gravy is too thick,add milk to 'loosen' it. Add garam masala and coriander leaves and switch off the flame. 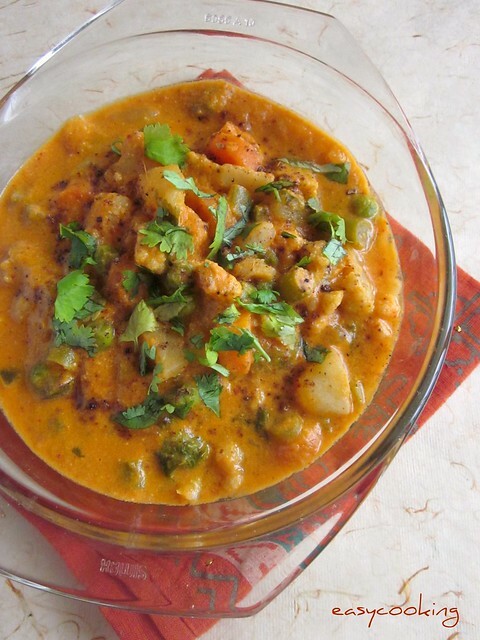 How did we like it - We like mixed vegetable curries as it is wholesome with rice or rotis.The vegetables can be of your choice,I've made it with Broccoli and baby corn too and it tastes equally good.The original recipe does not call for garam masala(I think! )and I felt it lacked something,a tsp of homemade garam masala gave the curry an extra punch. 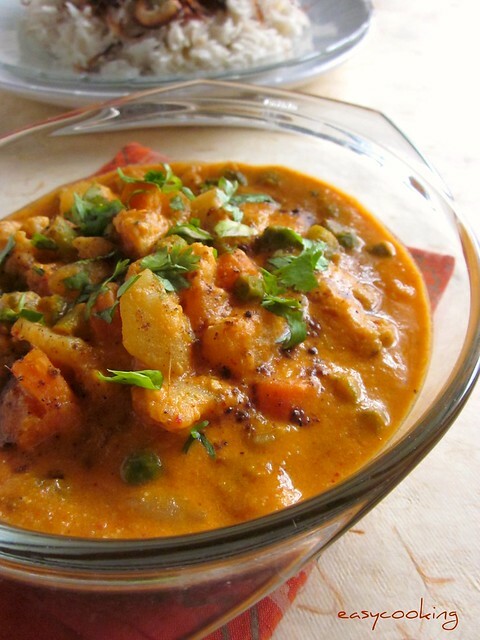 That looks great divya:-)I wud love to try it.. Will make a perfect combo with Ghee Rice!! I am coming here after a long time..and let me tell you honestly I was looking for a "Easy Pineapple Cake" recipe on Google and .. I thought the best place is- check Divya's blog :D ...you know sometimes you are in a mood to just bake :D .. and ... I love the new look of your blog :D .. very soft.. and musk.. I also loved the Tea cake recipe :D .. Thanks for having this blog, I swear..you are one of the trusted source for many like us.. here in India.. :D who make an attempt to bake..or cook :D ..
Looks super rich and healthy..
rich yummilicious and creamy curry. so rich!! I'm a Mallika fan too! :) wonderful pic! Rich, spicy & a royal curry!!! I love Mallika B`s recipes too...Try n buy most of her books...And I too watch cookery shows in any language...be it gujarathi, marathi, tamil, malyalam etc!!! Not that i know i all these land...I usually have no clue as to what they say but follow by carefully watching the ingredients..LOL!!! This looks amazing and delicious. Nice snaps as always. This is a good curry along with rotis. Will try this soon.